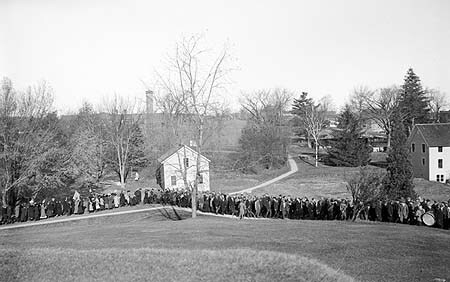 [ABOVE] To the shrieking of whistles and tolling of bells, Connecticut Agricultural College (CAC) students and faculty paraded around the campus on the morning of November 11, 1918 to celebrate the signing of the armistice that ended World War I. They then posed near Old Main for this photograph taken by faculty member Jerauld Manter, the unofficial college photographer. That night, they gathered again to light a huge bonfire. 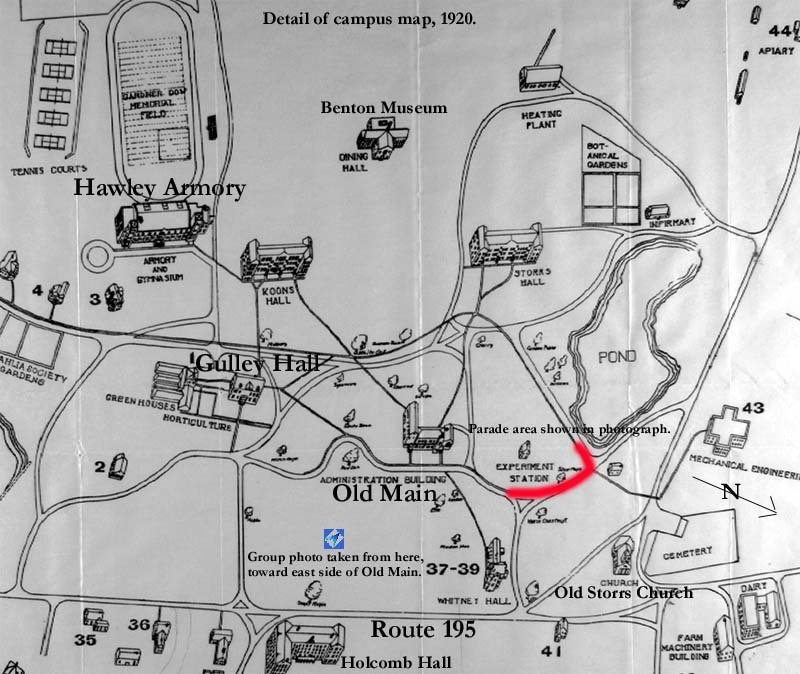 To locate this view, please go to an image of the campus map of 1920. 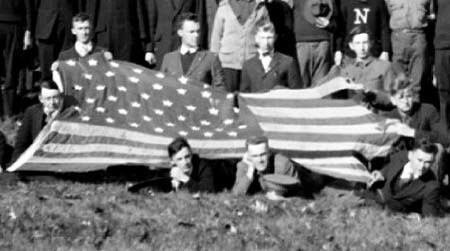 [ABOVE] This close-up from the group photograph shows the America flag held at center by several students. It is tatered and torn. Whether it was the campus flag or sent from the war in Europe is unknown. The student body consisted of men in the Student Army Training Corps (SATC), who were enrolled in special military training courses, and women who were taking the regular college curriculum courses. [ABOVE] To the right of the large American flag in the main photograph is a woman sitting on a stool. 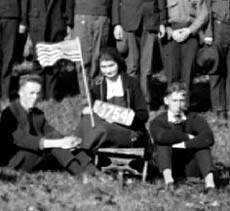 She is waving an American flag and around her neck is a sign with a number -- the significance of the number is unknown. 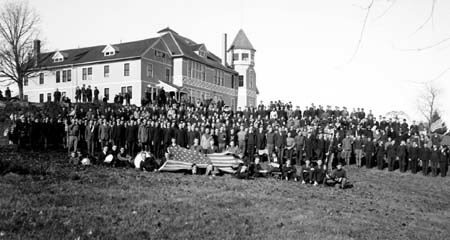 [ABOVE] Before posing beside Old Main -- the main campus facility, built in 1890 -- everyone paraded around the campus. This view looks north, toward the then unpaved North Eagleville Road, probably taken from the roof of the Old Main building. To the right is the back of Whitney Hall, which faced on to what is now Route 195. "Permission for suspension of classes being granted, joyous demonstrations became unrestrained. Exuberance of feeling and happiness gave vent to snake dances and long chain marches," said The Connecticut Campus in its bi-monthly issue of November 29 (Volume V, No. 1). Months later, a letter to the editor from a soldier in Europe referred to the article and noted that the response to the armistice was very different on the front lines: "..you write of such celebration, but we did not dare as the ground we trod upon at that time was still fresh from footprints of friends who had missed the news." The letter writer, Sergeant Nat Cohen, possibly a CAC graduate, said it was three days after November 11 before he and his men "started to feel happy." [ABOVE] A close-up from the parade photograph shows a lone observer as the flag-waving marchers pass by to the right of the Duck Pond beyond the trees. Today is it known as Swan Lake. 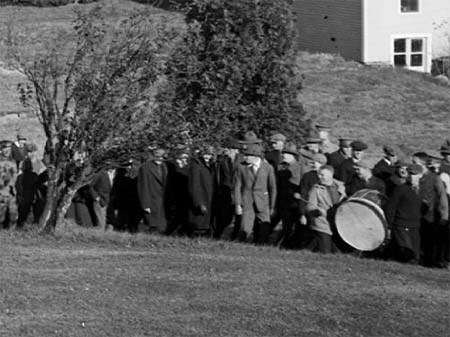 [ABOVE] This close-up from the right side of the photograph shows a drummer beating a bass drum as the marchers turn south to head toward Old Main. [ABOVE] "Throughout the day, the campus continually gave evidences of celebration," reported the Campus. A meeting at 11 a.m. in Hawley Armory included cheering led by Companies A and B of the Student Army Training Corps and community singing of songs such as "Pack Up Your Troubles" - "sung with more than the usual vim and enthusiasm" noted the Campus. Community signing continued through the day, as did preparations for an evening gathering for bonfire. 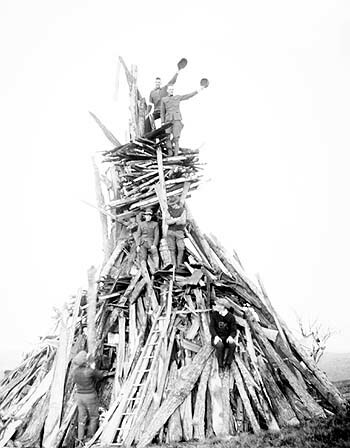 "The huge bonfire, the largest ever held at Storrs, was built under the direction of A.E. Moss (Albert Moss, professor of forestry) and A.G. Skinner on the top of Vineyard Hill." [ABOVE] "Promptly at seven o'clock the stack was fired by Mrs. C. L. Beach, and as it burst into flames a great cheer arose from the audience," reported the Campus. 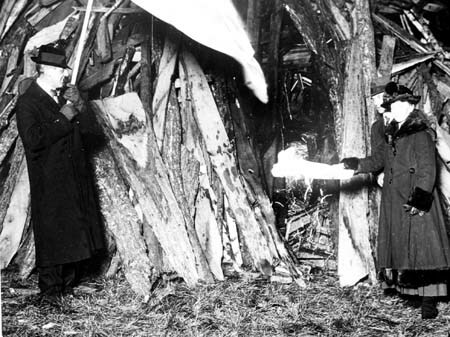 At left in the photograph above is CAC President Charles L. Beach, who waves an American flag as his wife, right, prepares to lit the fire (detail below). Among the "stunts" presented by students was a "tableau" performed by co-eds, depicting the flags of five allied nations. They sang the national anthem of each country, and their part of the ceremony closed with "The Star Spangled Banner." Faculty, with one portraying the devil, performed a mock trial of Germany's Kaiser Wilhelm which ended with the effigy of "Kaiser Bill" being thrown onto the fire, having been rejected as an entrant to Hell. "The program was concluded with Joan D'Arc dressed in flowing white robes and seated on a white horse." [ABOVE] Louise Crombie Beach had the honor of lighting the fire that set off the final event of the day of celebration. 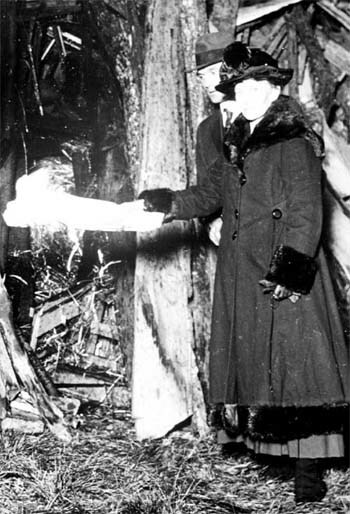 The man behind her is not identified, but it is possibly Edwin O. Smith, a faculty member and later a state legislator.